Running a workshop for 700 young people is indeed challenging. Normally the size of the group attending my workshops is not more than 30. I do give talks to large audiences but was unsure how I would be able to manage and hold people thru a five-hour session, especially when they are all restless young 20 year-olds. Hyderabad was a total surprise for me. 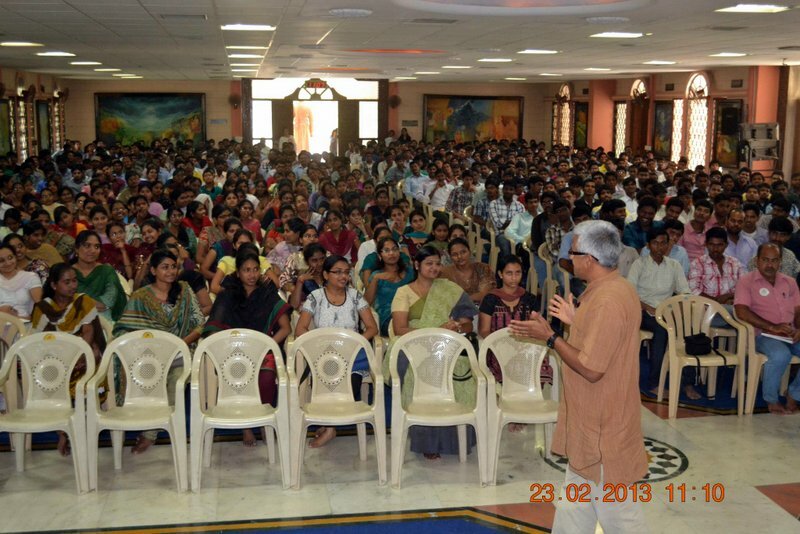 Though Swami Bodhamayanandaji had warned me to expect around 500 people, I was apprehensive that not many will turn up as it was just two days post the tragic bomb blasts in Hyderabad. I was very impressed with the life, energy and vibrancy that I saw around the Ramakrishna Math campus. I have traveled around the country and seen quite a few ashrams. But this was very different. From morning 6 am till late in the evening, I saw young men and women around the Math. This looked more like a university campus. So many activities for the youth were happening throughout the day. I was running this leadership workshop at a unique place that was started here more than a decade ago. This is the Vivekananda Institute of Human Excellence and they seem to be functioning round the year. Swami Bodhamayanandaji is the current director and is so full of ideas on how to engage these young people. He is indeed very popular and the youth are always milling around him. Early in the day, I struck a conversation with a young man and asked him what brought him to the center so early on a Saturday morning. His answer was simple yet pregnant with meaning. He told me that he did not really know why he came there each day, but something seemed to attract him and he here was. This magical attraction is indeed the power and potential of Swami Vivekananda and his message. If only we had more such centers around the country, our youth would indeed by so fully engaged in building a resurgent India. The workshop was a resounding success and I could engage and keep the whole process very interactive. It has now given me the confidence that we can run similar workshops around the country and inspire more and more young people to engage in the leadership required to involve themselves in nation building. Previous Article The exciting last few days!